I've been riding Manchester's buses since the early sixties, and find that the present day service is worse than it was when I was a child. 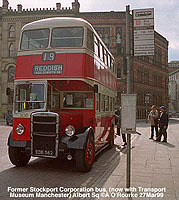 In those days, nearly all buses (such as the one below right) had a conductor who collected the fares. They used to whistle cheerfully while they worked, and kept an eye on both lower and upper decks, deterring vandalism and anti-social behaviour. Nowadays one man (or very occasionally, one woman) acts as both driver and cashier (often literally at the same time) causing long queues at bus stops and longer journey times. 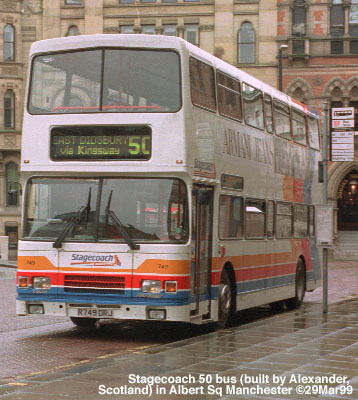 Many of today's buses are uncomfortable to ride and some I've seen on Manchester's streets emit so much exhaust, that, if teleported to California, they'd be sent straight to the scrap yard. 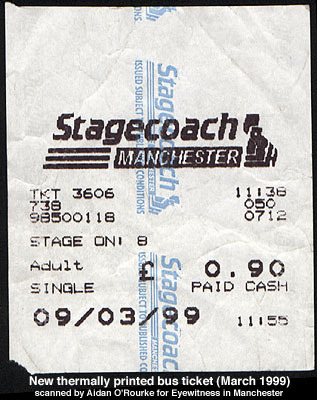 On the plus side, the new Alexander double deckers (left), operated by Stagecoach, are worthy successors the best buses of old, though the fare, for my mile and a half journey into town, at 90p (ticket below right), is expensive. True, you can buy a Megarider ticket for £6.50, but it's valid only on Stagecoach. There is very little co-ordination between all the different independent bus operators, who were brought in after the Conservatives deregulated public transport in 1986. Which brings me on to another point: When, oh when will tickets be valid across all operators and modes of public transport. 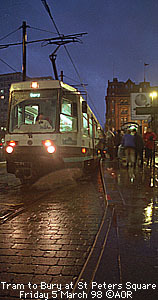 On the continent you buy a ticket and it's valid for one journey, even if you have to change from bus to tram or tram to train. Even better, you can buy a daily, weekly or monthly ticket valid on all forms of transport, so you never have to dig in your pocket for change. They've had this system for the past 30 years or so, why have we never been able to manage it here? 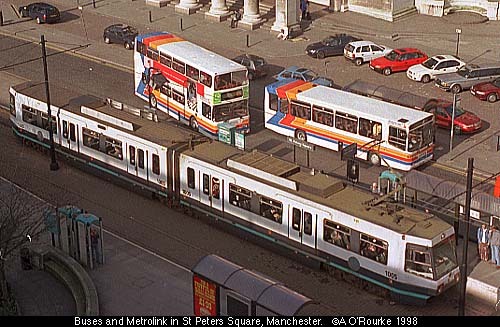 Yes, talking of trams, what a fuss is made about our Metrolink - marking us out as a forward-thinking top calibre European city - Poppycock! Many small towns in central Europe have longer and more extensive tram networks than ours, and they've been running them continuously since the War. As I said before, why did we ever get rid of them fifty years ago... [chorus] "Because they're more expensive" which brings us back to John Prescott's remarks of a week ago. Will I be writing on this page in 50 years time "Why oh why didn't we extend the Metrolink 50 years ago?" 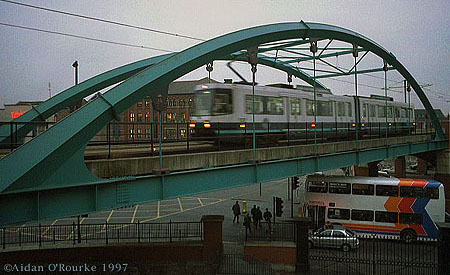 Extend the Metrolink to 5, 10 times its present length. Introduce fares valid across all modes of transport, with cheap season tickets. THE COMMONWEALTH GAMES will bring more than 5,600 jobs to the region, according to a study by KPMG. Last night Culture Secretary Chris Smith urged the Commonwealth Games organisers to raise more money by seeking TV sales and sponsorship. Councillor Richard Leese told BBC local radio station GMR today: "This study, which shows that the Commonwealth Games alone will produce over 5000 permanent jobs for the city, is very good news indeed". By the way, Culture Secretary Chris Smith will be presenting the awards at the Civic Society Awards Lunch on the 20th of April. More details on the Civic Society website. As mentioned previously, Eyewitness in Manchester has been nominated for the Spirit of Manchester award. 500 OFFICERS from Greater Manchester Police took part in Operation Victory, described as the biggest attack on criminality that Greater Manchester has ever seen. 66 addresses, mostly in Salford were raided at 6am on Tuesday morning. 59 people were arrested, many suspected of drug dealing, involvement in ram raids, burglaries and other crimes which have been causing misery and deprivation, as well as social and economic blight many areas (Eccles and Little Hulton to mention two reported crime "hot spots"). Under-cover officers gained the confidence of criminals, and gathered evidence on video and audio recordings. Nice work if you can get it, but not for me. Let's hope Operation Victory will make a difference. LOOKING AT THE FRONT PAGE of the MEN last week, I thought for a moment, those blocks of flats, set against a night sky criss-crossed with tracer fire, were in Salford. The location, of course, was Pristina, in Kosovo. I wondered what it would be like if Manchester was a war zone, and we were forced to flee our homes - I wouldn't want the enemy to get hold of my computer equipment - . But of course many Eyewitness in Manchester readers will remember the Blitz of 1940. Nowadays zones of international conflict seem a very long way away, though the current Nato military action has been causing controversy here. Worsley MP Terry Lewis condemned the bombing of Serbia because, he said, British forces are becoming embroiled in a civil war. Martin Bell says in his monthly column that the air strikes will not be effective in preventing the murder of Albanians in Kosovo. But Central Manchester MP and cabinet minister Tony Lloyd spoke on BBC 2's Newsnight last night, explaining the Government's position. Two thirds of respondents to an MEN poll said they didn't think a ground war was inevitable, and as for the Socialist Worker activists touting for signatures on Market Street last Saturday, their message was loud and clear: "Nato get out of the Balkans!" 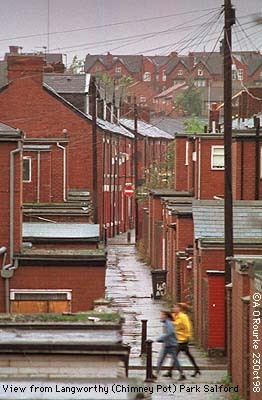 Here's another view of those flats in Salford. FOUR POLICE OFFICERS were injured during festivities to celebrate the Eid. They were hurt when they tried to stop a stolen car. 21 people were arrested for minor offences at the gathering, which attracted about 5000 people. There was a funfair in Platt Fields Park, and a heady atmosphere, with youths in Honda Civics cruising up and down Wilmslow Road Rusholme, waving the green and white flag of Pakistan. Middle East veterans (there, I'm using that word again!) like myself will know that this is Eid Al Adha, the second of the two Eids, which occur 8 weeks apart. ANGRY LORRY DRIVERS are planning a blockade of Manchester on 12th April, co-inciding with another one in London. It's been organised by a group called Transaction. They're protesting against the rise in the price of diesel to 65p a litre and road tax for goods vehicles to £5,750 a year. It's been predicted that the increase in the price of diesel will lead to a loss of 53,000 jobs in the UK, 8000 of them in the north west of England. And Manchester taxi drivers have been complaining too against an increase in the annual fee to from £150 to £205. DARREN VICKERS has been in the witness stand at Manchester Crown Court. He denies killing 8 year old Jamie Lavis. The circumstances of this case are both tragic and bizarre. I don't envy the jury, who will soon have to decide if the accused is guilty or innocent. 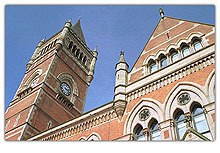 The trial is taking place at Manchester Crown Court, on Crown Square. 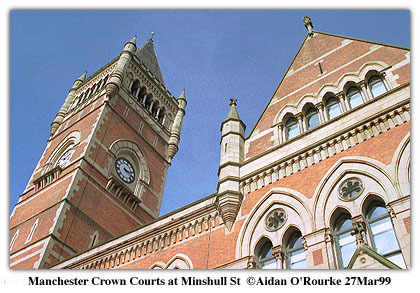 Here's Manchester's other courthouse (above left), on Minshull Street. 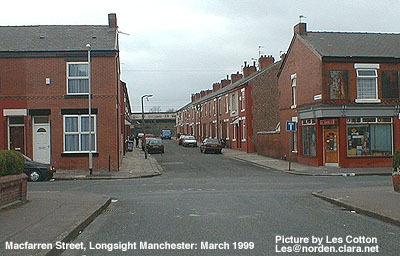 A FIFTEEN YEAR OLD BOY suffered 40% burns after coming into contact with power cables near McFarren St Longsight on Tuesday of last week (picture taken by EWM reader Les Cotton (E-mail:- Les@norden.clara.net) above right. The emergency services were called at around 6pm after local residents said they heard a loud bang and a big flash. An investigation is underway to find out how the boy managed to climb over the fence. The MEN has conducted a high profile campaign to persuade children to keep off the line, but in this case, the warnings weren't heeded. When I was fifteen, I knew exactly what 25,000 volts can do to you. And this afternoon, I saw the aftermath of an accident on the A560, next to the junction with the M56 - a boy had been knocked off his bicycle. Many drivers stopped and helped - one called the ambulance on his mobile phone. Let's hope the boy is OK.
24 YEAR OLD Michelle Jones has admitted abandoning her daughter 3 year old Charlotte Jones whom she left in woods to the north west of Warrington last November. She denied causing grievous bodily harm to the child. Warrington Crown Court accepted this plea. A NEW £6M PROJECT is going transform a section of the Rochdale Canal on Whitworth St (left). 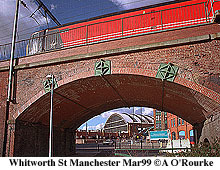 The arches overlooking the canal will be transformed into shops bars and restaurants, all accessed by a boardwalk with footbridges above the canal linking it to Whitworth St. The plan will tie in with the development of the Great Northern Warehouse nearby. Nick Payne, director of the development company Westport, said: "This will be a vital piece in the jigsaw of Manchester's regeneration. It will transform the city centre by linking the Castlefield projects with the Bridgewater Hall and the rest of the City Centre." The scheme will be completed by late summer. 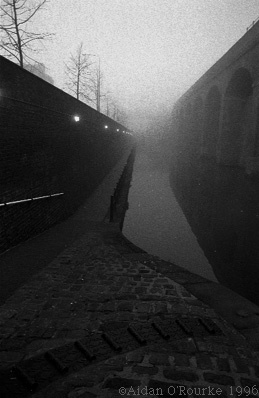 This section of the canal has been described as "dreary" but I say it's atmospheric. Good job I've photographed it - I'll be interested to see how it turns out. 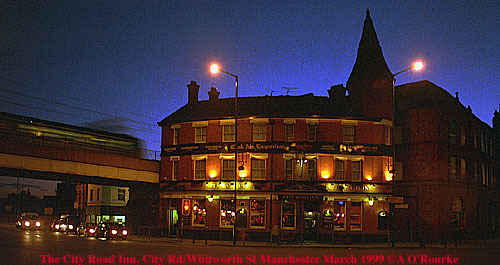 In the picture (right) is the City Arms, on the other side of Whitworth St from the new scheme. RENOVATION CONTINUES on the roof of Piccadilly Station. 10,000 panes of glass have been cleaned. The right hand side of the train shed, overlooking Fairfield Street is nearly finished. The job is costing £27m and is part of a five year £1bn renovation plan drawn up by Railtrack for their 2500 stations all over the UK. PERFORMANCES this week included... The Halle Orchestra at the Bridgewater Hall, Kula Shaker at the Apollo, "On Golden Pond" at Guide Bridge Theatre, "Lord of the Dance", MEN Arena, "Dreaming" at the Royal Exchange, and "Happy Days" at the Palace Theatre Manchester. A play dramatising the life of Hylda Baker is on at the Bolton Octagon. Hylda Baker was brought up in Farnworth - she played Nellie Pledge in "Nearest and Dearest", which I used to love as child. The play was researched and written Jean Fergusson who also plays Hylda herself. 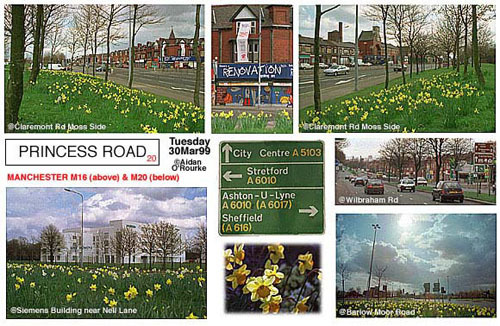 The Northern Ideal Homes & Leisure exhibition is on at GMEX from the 2nd to the 5th of April. ROCK GROUP STATUS QUO - yes, I can definitely describe them as "veterans" - they've been playing the same songs and wearing the same denims for over 30 years - will be playing at the Star and Garter pub, on Fairfield Street, (next to the Old Mayfield Station - pictures coming soon) on the 7th of April. Tickets are available by post, and cost £10 , though I think they must have sold out by now! In the MEN Postbag 27th of March, Stu Taylor, bassist of local band "Plan B" asks if his band can play at the MEN Arena - yes, I'm sure there's plenty of room to set up with an acoustic guitar and cap at the bottom of the steps outside! NEARLY 75% of traders in the city think that the Trafford Centre has had an adverse effect on their business. A recent survey said that there was a 15% drop in sales after the Trafford Centre opened, but figures have improved for the beginning of this year. And there may be a cash injection for Manchester's markets, including those at the Arndale Centre, Grey Mare Lane, Longsight, Moss Side, Gorton, Harpurhey and Wythenshawe. 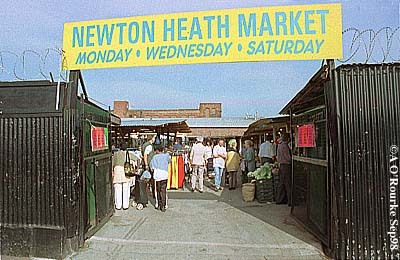 Newton Heath Market (right) has been advertising on billboards around the east of Manchester. A FILM SET IN MANCHESTER "The Van Boys" is to be screened for the first time at the Cannes Film Festival on 13th to 19th of May, Carl Palmer reports in "The Diary". It's directed by Didsbury-based film-maker John McCormack. Yvette Livesey, whom I interviewed last year, has a part in it. SIR IAN McKELLAN will be at the Cornerhouse on Thursday. He's introducing the screening of Gods and Monsters in which he stars as the 30's film director James Whale. Afterwards there will be a question and answer session with MEN film critic Kevin Bourke. 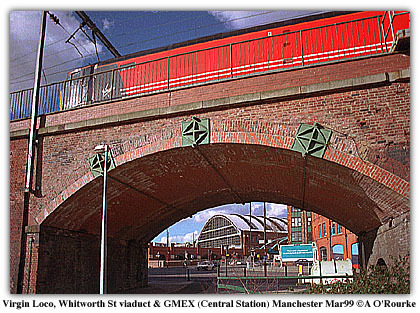 THE RECIPE OF VIMTO was today transported from the old Vimto offices on Ledson Rd Wythenshawe to the new company headquarters in Golborne, near Leigh. A pair of off-duty police motorcyclists acted as escorts - their fee was donated to charity. Vimto was invented in 1908 by the grandfather of company boss John Nicholls, who carried today's precious cargo. There's a Vimto statue (picture coming soon) outside UMIST on Granby Row, site of the original Vimto factory.